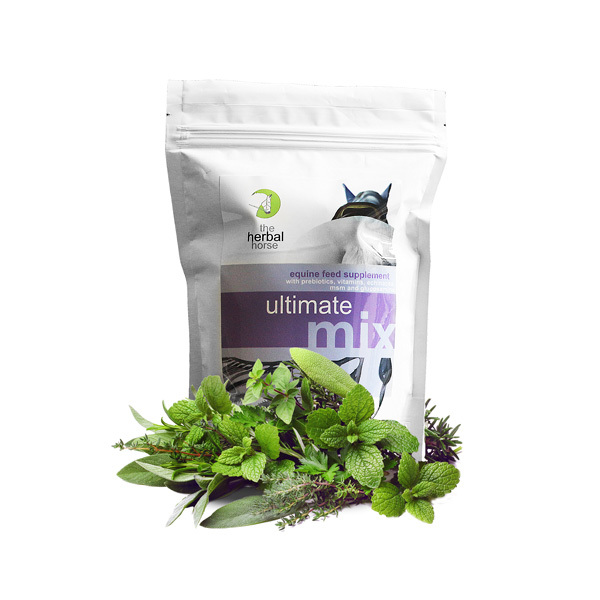 Ultimate Mix is formulated to be complete and cost-effective – stopping you needing to feed separate probiotic, multivitamin and joint supplements. I started using Herbal Horse Ultimate Mix on my 19 year old thoroughbred as he started to undergo the bone changes associated with age and as a general supplement. I have never looked back, he is happy, healthy and glossy! Thank you Herbal Horse for this wonderful product! I have 6 horses and they have over time used pretty much all the herbal horse products for various reasons. When they are not on a particular mix then they are all on ultimate and I am blowing my own trumpet here, but its allowed and all thanks to Beryl because my horses look absolutely stunning. They do not run out of energy when they play polocrosse, health issues are pretty much non existent and one of the biggest sceptics the guy who owns the stables where I livery them promotes herbal horse all the time and uses it on his horses too as he has seen in front of his eyes the results. Its extremely affordable and all natural.